So sad over Davy Jones. Upon hearing the news of Davy Jones' death, I just have not been able to blog. Yes, I was brokenhearted when we lost Corey Haim, but Corey was different. He lived a high risk lifestyle. Davy was healthy. He wasn't known as a wild party guy. You never saw Davy Jones on TMZ for boozing it up. You never saw Davy Jones beating up his wife. What I saw was Davy Jones as a sweet memory of my youth. From the ages of 13 to about 15, I had a quarterly zine called Hit Factory. This was before kids had computer graphics programs and scanners. Each issue featured awkwardly snipped and frayed black and white photos alongside Dot Matrix text. I dealt with the challenge of printing costs, ad rates (yes I had paid ads! ), shipping costs and in the end I think I lost money on the deal. But I wasn't in it for the money. I loved writing about my favorite band! Hit Factory grew to become a family effort. Dad would drive me to the local Minute Man copy center in Franklin Square, New York to print out dozens of Xerox copies. My little brother would help me collate the pages and staple. Mom would take me to the Valley Stream Post Office to load up on rolls of stamps and mail the issues. Having known firsthand what it's like to adore a teen idol, I credit The Monkees with inspiring me to pursue entertainment writing. I've since interviewed many teen bands and have published several books on teen idols. Not only did I write different articles for my zine, but my very first article ever published was about The Monkees. My very first celebrity interview was with Micky Dolenz. 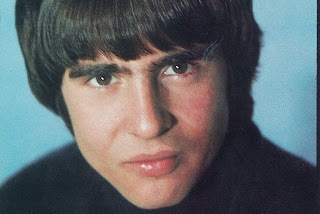 Although Davy wasn't my favorite Monkee, Davy Jones had such a beautiful voice. I loved his wit and his accent. He was the sweet Monkee. He was high energy and I could see why the girls loved him best. Davy, we will miss you. I was also shocked when I heard of Davy's death. I hadn't been home during the day and so when my friend called me and told me, I thought he was joking. I watched many reruns of "The Monkees" on TV as a kid in the '80s, and really enjoyed the music. Davy will definitely be missed! This was very sad news to me too. I also thought about you when I heard. Celebrity deaths don't usually affect me but this has saddened me. I know, so sad! He was one of my first celebrity crushes. I watched the Brady Bunch obsessively when I was about 12, back in the late 90s, and I so much remember the episode where Davy Jones came to see Marcia and sang that one thing at the school. Also, Daydream Believer is a beautiful song as well. 66 is not old. My uncle died of the same thing, a massive heart attack. So tragic. A very sad day, indeed. It's sad when the ones that are so genuine, talented and truly enjoy the entertaining life go so early.